I discovered The American Astronaut (2001) while channel-hopping late at night, and the broken space, skewed songs and weird world-building suited the dark. For months I’d floundered for descriptions, eventually settling on ‘It’s Blade Runner meets Rocky Horror via Clerks‘. But in the strictest sense I hadn’t actually been channel-hopping. I started coming across 10-minute fragments of the film on that online grindhouse YouTube, alongside the usual slew of dogs on skateboards and music videos: the universal guilty pleasures of the internet. American Astronaut‘s writer-director Cory McAbee seems to appreciate that. 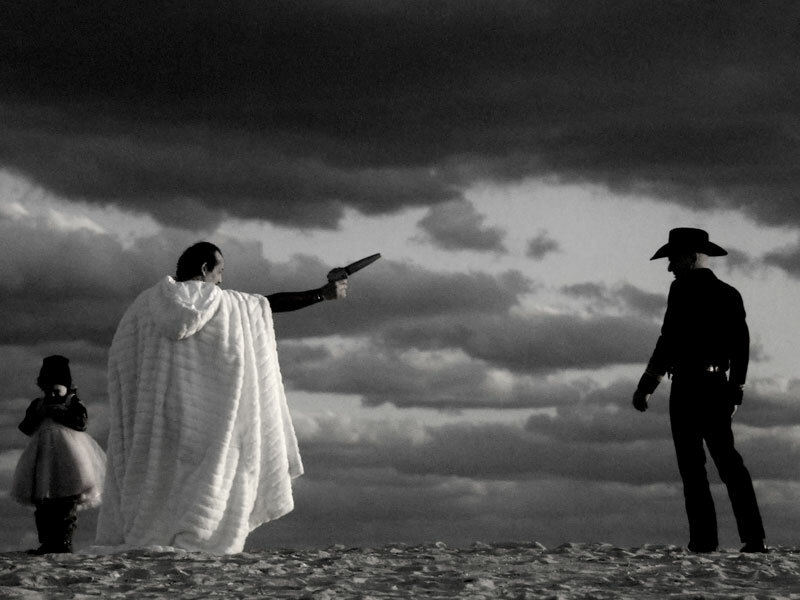 Approached by the Sundance Institute to create a film that could be viewed on mobile phones as easily as in cinemas, McAbee put together a six-part singing and dancing space-Western: Stingray Sam (2008). According to the theme song (oh yes, it has a theme song), Stingray Sam is not a hero: he (played by McAbee) is, in fact, a lounge singer on Mars, which now resembles a washed-up Vegas-in-space. One night, old friend The Quasar Kid (Crugie) arrives at his saloon, looking for Sam’s help to rescue a little girl. And so their adventures begin! To find out more, go to the Stingray Sam website, where you can watch all six episodes. Stingray Sam screened at Sci-Fi London 8. Sci-Fi London 9 runs from 28 April to 3 May at the Apollo Cinema in London. Despite the fragmented narrative, the heart of the film is a flushed whole, a story about fatherhood amid chaos that’s truly warming. In episode five, as the girl (played by the charming Willa Vy McAbee) drifts off to sleep, Sam and The Kid sing her ‘a lullaby song’ that skitters along the same path of patchwork verses and awkward rhymes that, I hope, everyone will recognise. It isn’t a stretch to see the McAbee family assuming such roles, with Cory building his crazy world of B-movies and dance routines while struggling to find the space to be the father he wants to be. SCI-FI-LONDON has announced its 48 Hour Film Challenge, which is open to everyone in the UK: the Challenge takes place on the weekend of 10-12 April. Participating teams register online at Sci-Fi London and then attend a briefing at one of 4 cinemas in the UK or receive information by text message. The rules are very simple: Sci-Fi London give you the TITLE, some DIALOGUE and a PROP list on the morning of Saturday 10 April and you have 2 days to make a complete 5-minute science fiction film. More details on the Sci-Fi London website. I watched chapters on a mobile, a laptop and a television, and it would be disingenuous to suggest there isn’t a difference: the depth of field really suits a large screen while the soundtrack never sounds better than when it bounces around headphones. But the infectious narrative and cast of misfits suit every platform, and for the first time in a long time I find myself idly clicking through videos and blogs, knowing I could be in danger of stumbling over art somewhere in the jumble. Dear Matthew, I’m Cory McAbee. I’m the writer/director of Stingray Sam. I just wanted to thank you for the wonderful review. Also, thank you for including the first two episodes. I honored. Thank You Cory, I’m looking forward to your next visit to the UK.